We all knew it would be coming soon, the range topping absurdly over the top powered Cayenne turbo S to take wife, kids and the family dog to near to warp inducing speeds. For if the previous range topping Cayenne Turbo was not enough for you with its 368 kW (500 hp) V8 engine and Acceleration from 0-100kph in 5.1s was not enough here comes a sledgehammer of performance figures. 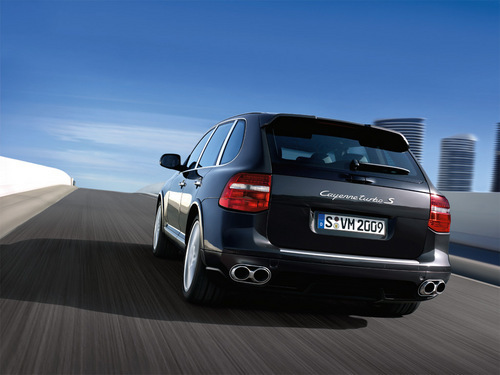 The engineers from Leipzig have tweaked the Turbocharged Cayenne’s 4.8 litre V8 to now provide 404kW (550 hp) of power and an extra 50 Nm of torque through a modified exhaust and engine control improvements. 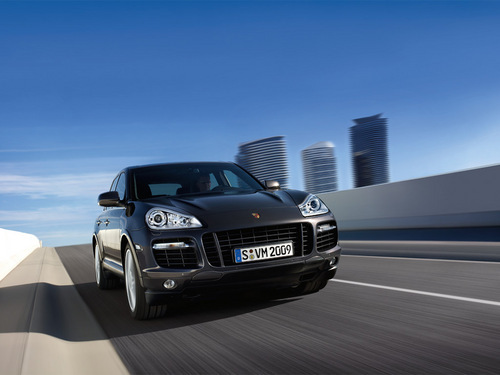 This improvement of power and torque brings this latest 4×4 powerhouse SUV the title of Porsches most powerful production Porsche ever, increasing on the Porsche GT2’s power output by an additional 20hp. The exterior of this classy beast hasn’t really made any changes for the better, this won’t please the fan base of ‘Cayenne visual looks’ haters with no substantial changes being made to the Cayenne Turbo’s looks. As standard the 21 inch SportPlus alloy wheels are fitted at all four corners and at the rear a quad port aluminium exhaust system with sports silencers give the car a slightly more sporty roar under throttle pressure. To stop all this 2.4 tonnes of luxury SUV in its turbo infueled pace are 6-piston 410 mm brake disks up front with 4-piston 370 mm’s at the rear. The carbon ceramic brakes as shown with brightly coloured Yellow brake callipers are an option as always on this Cayenne and susprisingly as a Porsche range-topper not fitted as standard. The Turbo S comes complete with all of Porsche’s trick suspension technologies such as variable height air suspension, ride-control height and Porsches Active Suspension Management (PASM) system as found on all of Porsche’s sportier high-end, higher priced models. On the Interior most of the Cayenne’s option packs are now standard on this range topper, with sports seats with memory, aluminium door panels boasting the ‘Turbo S’ naming, two-tone leather interior with exclusive colour choices, and Porsches great sat-nav system ‘Porsche Communication Multimedia System Management’ (PCM) all as standard. With the Cayenne Turbo retailing at $215k, expect the Cayenne Turbo S to go on sale soon with a Porsche sized premium on top of that, my guess around the $240k -$255k mark. 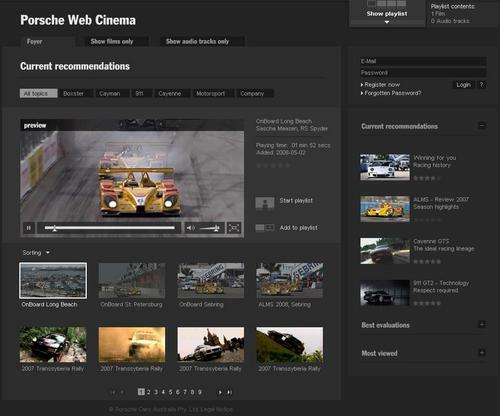 In other Porsche news, the new Porsche Web Cinema area of the Porsche website has just been opened. This is a showcase of all of Porsche’s great online videos they have crafted which are some of the best in the business as far as car manufacturing marketing videos go. A few movies of Porsche’s historic motor racing are contained also along with some recent footage of Porsche attempt at the Transsyberia Rally 2008, check it out. Says it all really, should we need to know anything else? No come on let’s get stuck in! 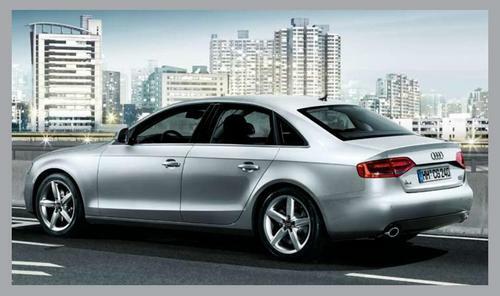 The all new Audi A4 was officially launched in Australia on Friday 2nd May 2008 and the Audi marketing department has stepped into rocket stations ready mode once again a new model is here! The new Audi A4 was launched this week with a star studded welcome at a secret location called “A4 Central” on Hickson road in Sydney. Audi Ambassador Jennifer Hawkins (well tats what Audi says) was on hand to unveil the launch of Audi’s latest bread earner car the A4. 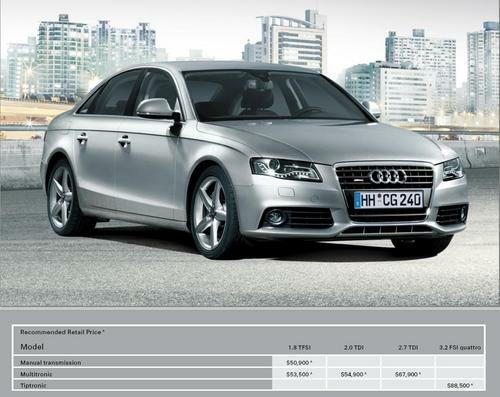 Some 8.5 million A4’s have been sold since it went into production – now compared to your average Japanese car manufacture like the currently unstoppable ‘Toy-mo-ta’ brand this may not seem like incredible figures but this is a prestige brand after all being bought by the middle to upper class market so it’s not a figure to scoff at by any means. Now I’ve been scouring the design sheets for this newly rejuvenated A4 series and it really does mark an improvement in both the technical and visual areas. Let’s look at what builds this car to be the latest improvement on what some would say already is a hard car to improve on. OK so technological features, we have the new Audi Drive Select system which is a variable suspension softness setup allowing you to choose from Comfort, Auto or ‘Dynamic suspension settings, the last being the M-sport BMW setting then hmmm. The new ‘Drive assist’ system that has adaptive cruise control when set to ON simular to the Mercedes system where using bumper located radar it intelligently slows the car cruise controlling into the back of the next car in front of you, this could be as the car in front slam’s on the brakes to take that late exit to a McDonalds. The last new item is a Bang & Olufsen designed ‘too many to count’ speaker system with all kinds of tweeter speakers all over the car, coupled with a clever outside noise cancelling system it should deliver hi-fi quality interior sound as you cruse to your next destination. Oh did I mention keyless entry and the option of Xenon’s across the board, this new A4 has packed in the lot. For the exterior it’s kind of a similar upgrade, the classy but understated German look, just a little more refined and teased out in places, the most noticeable addition is the LED day lights that seem to be popping up all over the Audi range now, borrowing from the recent Audi R8 and A5’s LED look with the ‘look at me coming’ daytime lights. I was asked to dress up my car for a wedding this weekend and I was more than happy to help out. It was an amazing sunny warm Autumn morning in Sydney, just Perfect weather for a wedding you couldn’t of asked for better weather. All the shiny Lotus lined up outside the wedding reception. An interesting shot I took looking along the line, I love the colours in this shot. Something Old and new together. “thanks so much for yesterday. The cars looked awesome and were a hit with all the guests. I had someone come up to me after the reception saying their table was having a debate as to whether the cars were nearer in value to $100,000 or $400,000! Hopefully we will get some great photos of the line up coming across Anzac bridge and the harbour bridge. In the last photo Beddo has posted you will notice the bride without a veil. That is because it took flight as we were coming across the harbour bridge with Angela allowing it to fly free for the photographer who was hanging out of the car in front getting photos.